Moms are invited to celebrate Mother's Day with an unforgettable tea party for the whole family at the beloved Tea Cups ride at Morey's Piers in Wildwood. 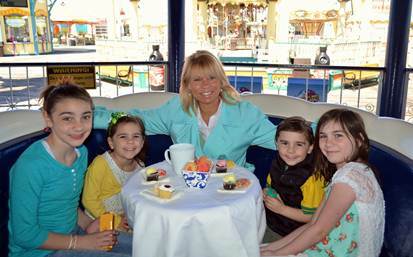 This Mother’s Day it’s tea for two… or three… or four… or more at Morey’s Piers & Beachfront Waterparks, located on the boardwalk in Wildwoods, NJ, where moms are invited to celebrate their special day with an unforgettable tea party for the whole family at the beloved Tea Cups ride. Moms visiting the classic shore side destination on Sunday, May 12, 2013, will also ride free from 11am to 5pm on Mariner’s Landing and Surfside Pier. With more than 100 rides and attractions to choose from, the entire family can ride on one of the largest Ferris wheels on the east coast, loop upside down on the Great Nor’easter coaster, splash down one of the steepest log flumes, and much more. From 12pm to 2pm, families can grab a seat in an oversized “English tea cup” and enjoy complimentary afternoon tea with an assortment of cookies, biscotti’s, and biscuits at the Tea Cups attraction, featuring new awnings that provide guests additional shade. Kids will have the opportunity to decorate personalized sugar cookies for mom at the cookie decorating station at the Parents Pavilion on Mariner’s Landing Pier. Also available at the Parents Pavilion is a special photo area complete with signs and props for Mom and the entire family to take pictures.